The recent meeting between the leaders of Russia and Turkey in Moscow demonstrated that both sides are determined not to do anything that could jeopardize their bilateral relations, which they both see as very beneficial, said Galip Dalay, a visitor academic at the University of Oxford Department of Politics and International Relations, non-resident fellow at Brookings Institution Doha Centre and research director at Al Sharq Forum, in an interview with valdaiclub.com on Friday. The Putin-Erdogan meeting, held in Moscow on January 23, was focused on Syria, where a new reality on the ground is emerging following the announced withdrawal of US troops. According to Dalay, the discussion of the “safe zones” along the Syria-Turkey border is going to become a new factor of the intra-Syrian settlement. With all actors in Syria having different goals and visions, this discussion is likely to become a process, not a deal, he believes. There will be some overlap and friction between these two processes, but Turkey will most probably want to send a message to its Astana partners that its engagement with the US is not coming at their expense, the expert believes. But both Russia and Turkey seem to have the motivation to set aside their differences on northeastern Syria and avoid turning it into an issue that can damage their bilateral relations and also the regional situation. When it comes to Idlib, there is a broad agreement between Turkey and Russia that it needs to be secured from any form of radical organizations, including Hay’at Tahrir al-Sham (HTS), which is now gaining ground vis-à-vis other “moderate opposition” forces including those supported by Turkey. “I do not think that Russia wants to use this as an excuse for a full-fledged military campaign which would put Turkey in a very difficult position. Although there is much disagreement, one point of convergence is that this area must be cleared of HTS,” Dalay said. The Turkish-Russian relations are to a large extent informed by geopolitical incompatibility, the expert pointed out. “If you look at many areas – not only in the Middle East, but also in the Balkans, Caucasus or East Mediterranean – almost everywhere the strategic priorities of Russia and Turkey are not in alignment,” he said. 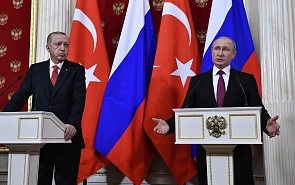 But even though these relations are competitive rather than cooperative, this may be the reason that made Russian-Turkish cooperation quite necessary. “The fact that Turkey was the main backer of the opposition and Russia was the main international patron of the Syrian regime is what is giving meaning to this process,” Dalay said. “The Astana process would not have started without Russia, but it would not have gained international legitimacy without Turkey, which brought in the Syrian opposition. In this regard, the strategic incompatibility between Turkey and Russia is both an issue and something that motivates them to engage each other more. When you have competing visions, interests and alliance structure, it makes your engagement on various issues much more meaningful than it would have been otherwise,” he concluded.